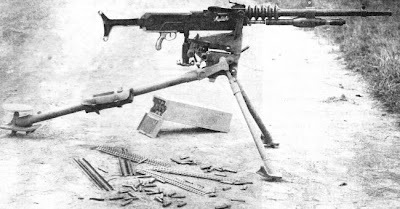 The Mle 1914 Hotchkiss machine gun chambered for the 8mm Lebel cartridge became the standard machine gun of the French Army during World War I. It was manufactured by the French arms company Hotchkiss et Cie, which had been established in the 1860s by American industrialist Benjamin B. Hotchkiss. The gas-actuated Hotchkiss system was first formulated in 1895 by Odkolek von Augeza ( Austria ) and improved into its final form by Hotchkiss armament engineers Laurence Benet and Henri Mercie. The Mle 1914 was the last version of a series of nearly identical Hotchkiss designs : the Mle 1897, Mle 1900 and the Mle 1908. 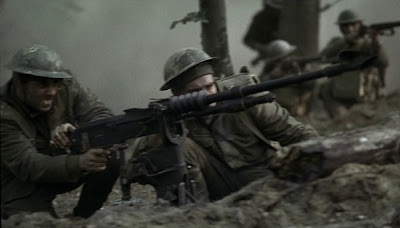 The heavy Mle 1914 Hotchkiss is not to be confused with the lighter Hotchkiss M1909 (the U.S. "Benet-Mercie" or the British Hotchkiss Mark I). At the beginning of World War I, the St. Étienne Mle 1907 was the standard machine gun of French infantry. However, due to inferior field performance by the St. Etienne, the Hotchkiss Mle 1914 became the French infantry standard in late 1917. The American Expeditionary Forces (A.E.F.) in France also used the Mle 1914 Hotchkiss extensively in 1917 and 1918. Hotchkiss heavy machine guns, some being of earlier types, were also used in combat by Japan, Chile, Mexico, Spain, Belgium, Brazil and Poland. 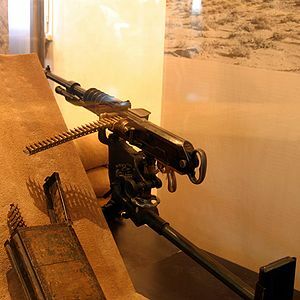 The Hotchkiss machine gun, a sturdy and reliable weapon, remained in active service with the French army until the early 1940s. By the end of 1918, 47,000 Hotchkiss machine guns had already been delivered to the French army alone. The American Expeditionary Forces ( A.E.F.) 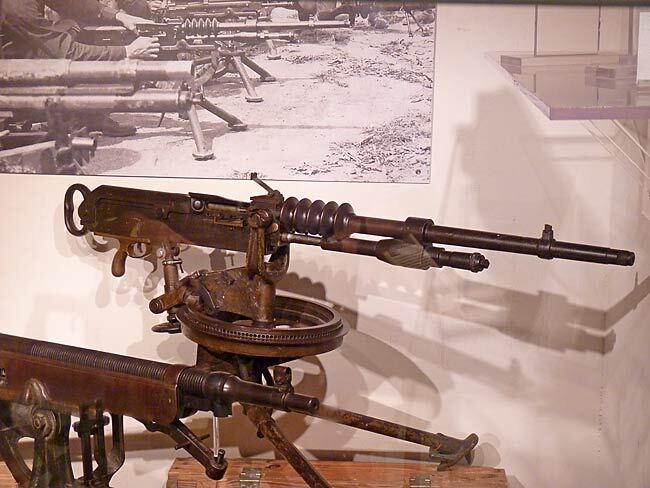 in France purchased 7,000 Hotchkiss machine guns in 8mm Lebel, between 1917 and 1918, and used them extensively at the front during the Saint-Mihiel and Meuse-Argonne offensives. The Hotchkiss was based on a design by Captain Baron A. Odkolek von Augeza of Vienna. The patents had been purchased by the firm of Benjamin Hotchkiss, based in Saint-Denis, near Paris. Benjamin Hotchkiss was no longer alive at the time of the purchase, but the Odkolek design was further developed and greatly improved under the direction of American-born Laurence V. Benet (1863–1948) with the assistance of Henri Mercie. After trials that began in 1895, development issues were resolved leading to the initial purchase of the Hotchkiss gun by the French Military in 1897. In 1898 an export model was also offered for international sales by Hotchkiss. 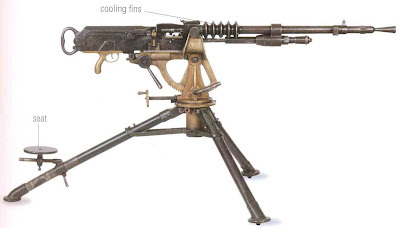 With some useful changes, such as the addition of five cooling radiator rings on the barrel, the same basic design led to the M1900, and later to the M1914 (with minor improvements that were added since 1908). In the meantime adoption of the St. Étienne Mle 1907 (a French government arsenal product ) to equip the infantry went through in 1908. Nevertheless Hotchkiss machine guns were also purchased by the French military for use in overseas colonies and by mountain troops in the Alps. By the 1916, during World War I, French line infantry, still equipped with the unsatisfactory Saint-Etienne, convinced General Petain that it needed the more reliable Hotchkiss. It got its wish and French infantry divisions became progressively outfitted with the Hotchkiss gun in late 1917 and early 1918. The Hotchkiss machine gun was gas actuated and air-cooled, in contrast to the Maxim gun which was recoil operated and water-cooled. The Hotchkiss machine gun barrel features five large annular rings which materially assisted natural cooling and retarded overheating. The gas cylinder under the barrel features a regulator piston which can be adjusted to the normal rate of fire of 450 rounds per minute. The Hotchkiss has only 32 parts, including four coil springs and no screws or pins whatsoever. All parts of the gun are constructed in such a manner that it is impossible to assemble them improperly. The Hotchkiss fired from an open bolt, a disposition existing today in all machine guns in order to avoid "cook-offs" . 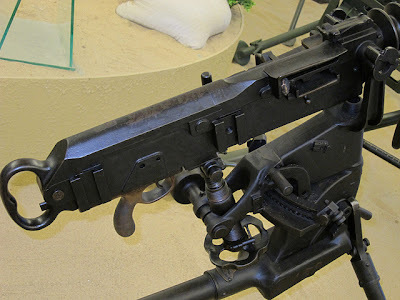 Although the Hotchkiss machine gun was easy to feed continuously with a three man team, each individual strip held only 24 rounds of 8mm Lebel ammunition. 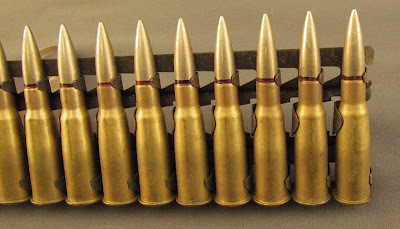 Each empty feed strip was ejected automatically after its last round had been fired, leaving the bolt open in the rear position. Then introducing a new loaded strip into the gun triggered the release forward of the bolt and firing resumed. The Hotchkiss strips performed well with a three-man crew, but their capacity was too small for a single gunner firing from the inside of a tank. This led to the adoption of a 250-round articulated metal belt in 1917. It was widely used in all French tanks of the period and in some military airplanes . Beginning in 1900, two basic tripod types were used prior to World War I, when the final and most effective third Hotchkiss tripod model (the Mle 1916) became adopted and widely distributed. A tripod that could be used for both the Hotchkiss and the St. Etienne machine guns was issued in 1915: the so-called "Omnibus Tripod". 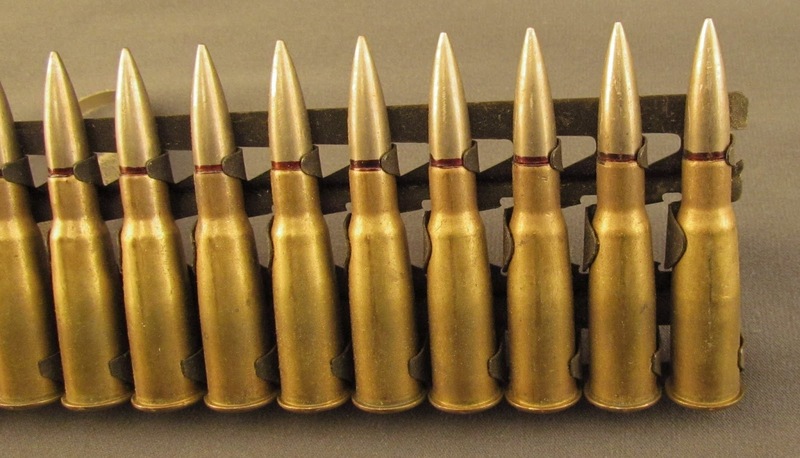 The French Hotchkiss had a rate of fire of approximately 450 rounds per minute of 8 mm Lebel ammunition, and a maximum effective range of 3,800 m (4,150 yd) with the "Balle D" bullet. Fire for effect was usually in successive bursts of 8 to 10 rounds. The gun could sustain continuous firing of about 120 aimed shots per minute almost indefinitely ( US War Department Handbook,1917 ) except for occasional barrel changes (during continuous fire, approximately every 1,000 rounds) which were quick and easy to perform with a special wrench. The barrel could attain a temperature of about 400 °C, at which temperature it would be dark red in color. At this point the barrel dissipated heat as fast as it was generated. This only occurred after long continuous firing in a combat emergency situation. The most common complaint about the Hotchkiss was its weight: the gun and tripod weighed a total of 110 pounds. There were also complaints concerning the tripods, particularly the "Omnibus" tripods, which were perceived as too high above ground and too heavy. The principal user of the Mle 1914 Hotchkiss machine gun was French infantry during World War I and in 1939-40. The Hotchkiss company delivered 47,000 Mle 1914 machine guns to the French Army between 1914 and the end of 1918. Several hundred were in the 11 mm Gras caliber for anti balloons use since it was the smallest caliber to be able to receive an incendiary bullet but all the others were in 8 mmLebel. 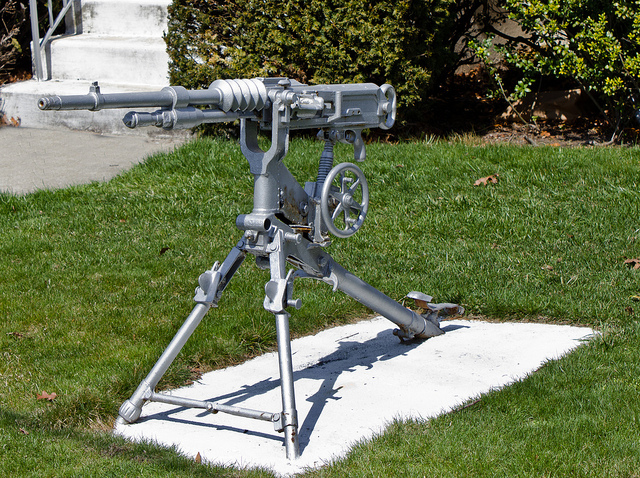 The second largest user of the Hotchkiss gun was the American Expeditionary Forces in France between 1917 and 1918. 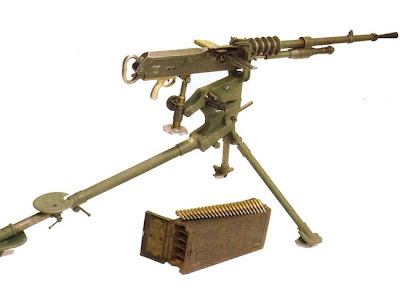 The U.S. purchased and used in combat 7,000 Mle 1914 Hotchkis machine guns, also in 8 mm Lebel. Hotchkiss machine guns in 6.5 mm caliber were successfully deployed by Japan. 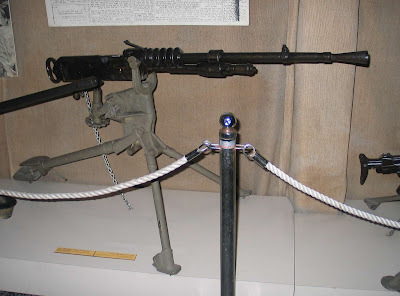 The production of the gun was licensed to Japan to become the Type 3 Heavy Machine Gun, but the cartridge was the standard Japanese 6.5x50mm Arisaka rather than the original 8 mm ammunition. 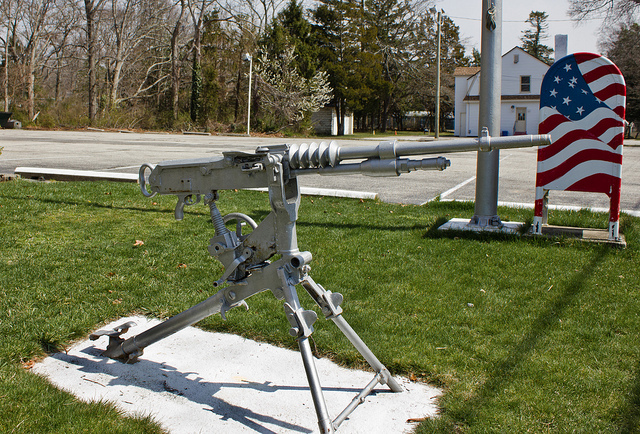 The Type 92 Heavy Machine Gun, a scaled up Type 3 chambered for 7.7mm, was also based on the Hotchkiss design. 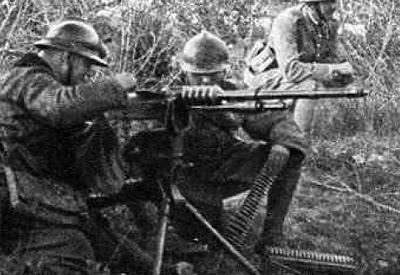 In 1930 to 1935, the Chinese Nationalist Government bought 1,192 Hotchkiss M1914 machine guns from France. 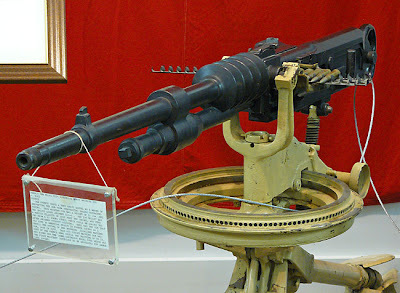 The Chinese also copied this gun and using the German 7.92×57mm Mauser. After the Second Sino-Japanese War broke out in 1937, the Chinese also ordered 1,300 guns, but only 300 guns were delivered. Hotchkiss machine guns firing 7 mm Mauser ammunition equipped both sides (Governmental forces and Pancho Villa's) during the Mexican Revolution (1910–1920). 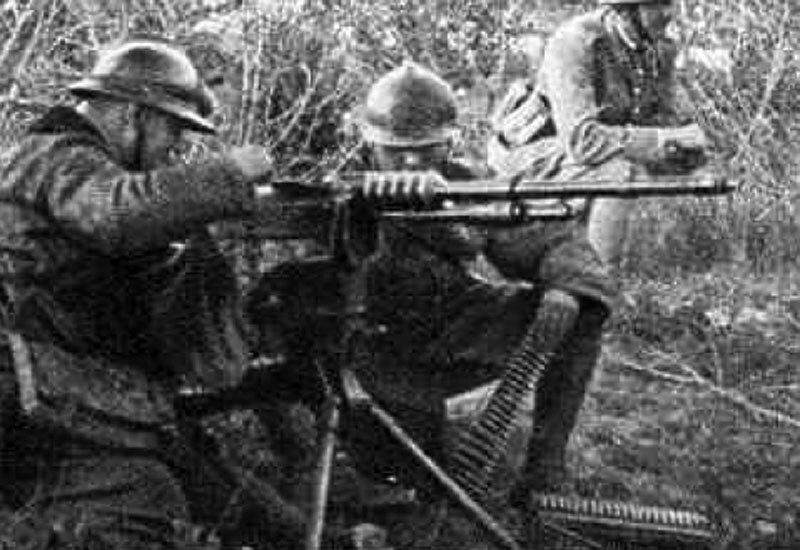 The same type of 7 mm Hotchkiss machine gun, built under license in Spain where it was the standard medium machine gun, was widely used by the conflicting parties involved in the Spanish Civil War (1930's). Furthermore, the Mle 1914 Hotchkiss in 8 mm Lebel was mounted in all French tanks and armored cars of World War I. Some examples of tanks that used the Mle 1914 Hotchkiss include the Schneider CA1, St Chamond, Renault FT-17 and Char 2C. Conversely, British tanks and armored cars were outfitted with the British version of the distinctly different Mle 1909 light Hotchkiss (a.k.a. the "Benet-Mercie"). A recently published series of modern firing tests with vintage machine guns summarizes the Mle 1914 Hotchkiss as being: "A heavy and rock-steady combination of gun and tripod, the world's first efficient air cooled machine gun is admirably reliable and accurate" (Robert Bruce, 1997). These qualities provided the French military with an excuse to keep the Hotchkiss in active service far beyond its point of obsolescence and into World War II. The last recorded uses of the Hotchkiss were in Indochina and Algeria, after World War II, to defend outposts in static positions.